Debut novelist A. Gavazzoni is here today to chat about her psychological thriller, Behind the Door – Book #1 in the Hidden Motives series. During her virtual book tour, A will be awarding a $25 Amazon or Barnes and Noble (winner’s choice) gift card to a lucky randomly drawn winner. To be entered for a chance to win, use the form below. To increase your chances of winning, feel free to visit her other tour stops and enter there, too! A. Gavazzoni is a Brazilian author. She just won The Golden Book Award 2017- Readers Choice for her first novel Behind the Door and also an honorable mention at Paris Book Festival 2017 Adriana is a lawyer, a former professor of law and a writer of novels and legal books, but she is also a voracious reader. She speaks four languages: English, French, Portuguese and Spanish. When she is not practicing law or writing, she enjoys many interests and is a very active person. She loves to dance (Tango) and workout. She loves to travel, loves good wine, and has been studying astrology for fifteen years. She paints and loves to cook. She has two poodles -Gaia and Juno -and loves all animals. She is an aunt of four nieces who enjoy to paint and cook alongside their aunt. She lives in Brazil and is in the process of writing her next novel. Welcome, A. Please share a little bit about your current release. 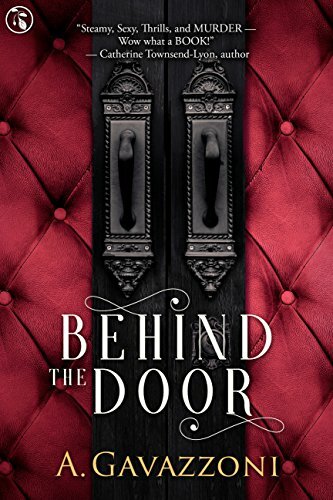 Behind the Door is my first novel, book one in Hidden Motives series, followed by Lara’s Journal, also recently released. The human soul and its complexity inspired me to write. I love to observe people and try to understand their motives regarding why they behave the way they do. That’s what my books are about, understanding the human mind and soul. More than a hint of pain showed in her eyes…unsettling to find in such a young and beautiful woman. Who could have hurt her so much that she’d come to behave as she did? I’d finally said something that had surprised her. I always loved to write. As a lawyer, I’m always writing other people’s stories, but only when my first novel was published did I feel as if I was a real writer. No, I’m an active lawyer, and I have to divide my time between my clients, my legal profession, and writing. I organized my schedule in a way that it allows me to write every day. I also have other hobbies, such as amateur astrology and dancing, I love to cook for my friends, and I love to be with them for a good laugh, and I think it’s all a matter of organizing things. I send notes to myself whenever I have an idea, and I’m far away of a computer. I’ll use my phone to send myself an email or text. So many things. A race car driver, a writer, an astronaut, a scientist, an engineer, a ballerina— all those things at once! But since I’m a writer, I can be all those things in my mind. I’m a very positive person, and I try to see the bright side of everything. Life is much easier when you do that. Congrats on your debut book release and thanks so much for offering a Giveaway! What book are you looking forward to reading in the next few months? Thanks for the giveaway. I hope that I win. Bernie W BWallace1980(at)hotmail(d0t)com. Hello Nikolina! I hope you also enjoy my novels!!!! Sounds like you have a very busy life. I'm surprised you have time to write.